Is your A/C not cooling enough, or not turning on at all? Don’t sweat. Give Richmond’s Air a ring. Houston isn’t known as the capital of the Sunbelt for nothing. With summer afternoon temperatures frequently hitting the 90s or even 100s, the last thing you need is for your air conditioner to call it quits — leaving you and your family stranded in the unbearable heat. The near year-long East Texas heat and humidity puts a tremendous strain on your home or HVAC cooling system over time, which is why it’s so important to schedule regular preventive maintenance and contact a trusted local AC repair company when things go wrong. 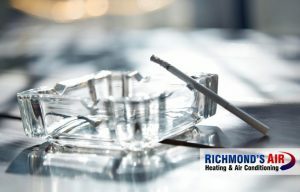 At Richmond’s Air, we’ve been delivering quality AC repairs since 2002. We specialize in residential maintenance services, plus all of our work is 100% guaranteed by a 1-year parts and labor warranty on repairs. Find out why our customers say we’re the best AC repair company in Houston! What’s wrong with my air conditioning system? Let’s face it, a lot can go wrong with your residential AC system over the course of its lifespan. Your refrigerant might start leaking; the condensate drain line can overflow; the air ducts can get clogged; your compressor might fail; or perhaps the unit that was installed is too small for your space. Give us a call right away and we’ll dispatch a technician immediately to tell you exactly what the problem is and how much it will cost to fix. What does air conditioning repair cost? It depends on what the issue is with your system. Some AC repairs are quick fixes that require just a little labor, while other problems may require extensive work and expensive replacement parts. 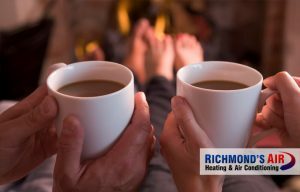 With Richmond’s Air, you can rest assured that we’ll find the most affordable and cost-effective solution to any air conditioning issue that arises. Contact us to schedule a FREE service call with repair. How can I tell if my A/C needs maintenance? If your AC isn’t turning on, that’s a sure-fire indication that something is wrong and it’s time to contact a professional. However, like cars, air conditioning systems often give warning signs before a full breakdown occurs. Knowing how to spot these red flags can save you a whole lot of discomfort, stress, and money in the long run. Read more on how to troubleshoot common A/C issues that plague homeowners. If you’re using your air conditioner occasionally, you may be able to get away with changing the filter every six weeks to three months. But when your air is running a lot, you should change your air filter at least every month. The good news is that changing an air filter is super easy. Feel free contact us, or check out our related article for more information on how to change your air filter. A heat pump is a device that works by transferring hot air out of a space when it’s warm outside, and brings heat into a space from outside environment when it’s cold. The term “heat pump” isn’t the best name for this versatile piece of HVAC equipment since it performs double duty as both an air conditioner and a heat source. Knowing when it’s time to replace your old AC unit for a brand new one vs. repairing the old system can be a difficult decision. Is it worth spending the money to fix something that’s broken, or are you better off going with a newer system altogether? There are various factors to consider when making this choice, such as the age of your unit, estimated repair costs, the $5,000 rule, warranty, etc. Check out this article for a full breakdown of the debate. We’re glad you asked! Scheduling preventive maintenance at least once or twice a year is the best way to avoid unexpected breakdowns and costly repairs down the road. We recommend scheduling an appointment for sometime in the fall and spring, before and after the summer season when your AC is working overtime. 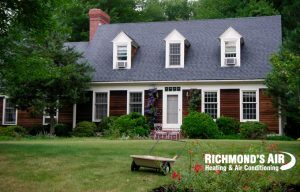 An experienced Richmond’s Air technician can perform a full-point inspection on your heating and cooling system — checking efficiency, performing delta-t drop, humidity removal, and much more. We spend more time than the average HVAC company who just comes in and looks at a unit, then leaves. Also, unlike other companies, we’ll clean your system, including the heating coils. We proudly serve the greater Houston area, helping homeowners stay comfortable all year round with preventative maintenance, emergency repairs, and system installation services. Our service area extends to Bellaire, Katy, Spring (including The Woodlands), Sugar Land, W. University Place, Bunker Hill Village, Hedwig Village, Hilshire Village, Jersey Village, Piney Point, Spring Valley Village, and many other nearby neighborhoods. Our headquarters are conveniently located near downtown Houston, just blocks from the intersection of the North and Katy Freeways (I-45 and I-10 respectively). Regardless of where you live, we can travel to your location quickly. Give us a call or fill out a contact form to schedule a repair as soon as possible.